Oxidation is the chemical process in which there is a chemical reaction that involves the moving of electrons. To be more precise, it means that the substance that is giving away electrons is oxidized. In simple terms it means that the surface of any object is affected when time goes by. 3 What types of oxidation will you encounter while detailing? 6 Can you prevent oxidation? Basically, any object can oxidize. Cars, motorcycles and any other vehicle that is exposed to air. Oxygen is a chemical element with symbol O and atomic number 8. It is a member of the chalcogen group on the periodic table and is a highly reactive nonmetal and oxidizing agent that readily forms compounds (notably oxides) with most elements. 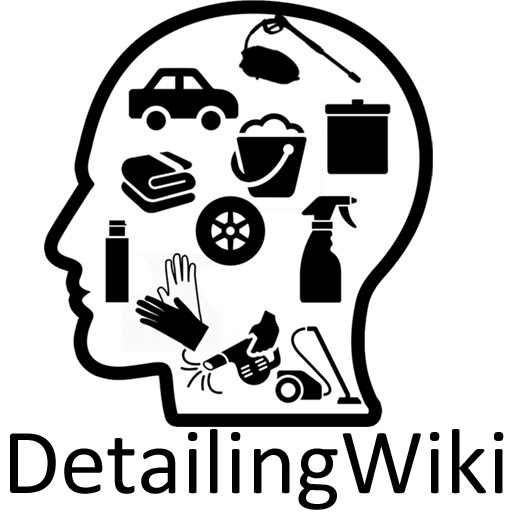 Oxygen causes oxidation, even though it is in relative small terms, it still affects any element in comes into contact with. For a detailer this means that any surface eventually shows signs of oxidation. This could mean that a certain metal will start to show surface imperfections even though it doesn’t get dirty, or comes into contact with anything else then air. This also means that paintwork oxidizes. The surface of the paintwork will change very slightly in molecular structure. It is this oxidation that needs to be removed to show the glossy finish underneath. Removing the surface oxidation will help protective products such as wax, sealants and coatings to bond better with the surface. This is actually one of the easier processes. Most surface imperfections are causes by a big difference in the microscopic unevenness of a surface. If the difference is big enough, we start to call it an imperfection or even a scratch or RDS. What types of oxidation will you encounter while detailing? 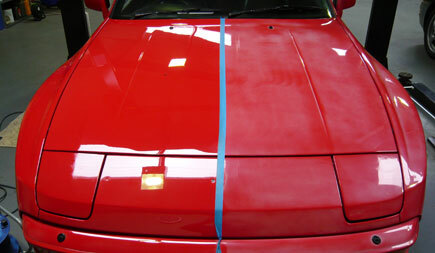 There are several forms of oxidation you might encounter while detailing, and some are easier to remove then others. Oxidation causes the microscopic surface to chance structure, the smooth flat and highly refractive surface changes into a matte surface with a low refractive index. Simply put: less shiny. Also, when oxidation is treated quickly enough, it will prevent spreading out to more sensitive areas and complete disintegration will be prevented. When iron oxide comes into play, it can cause a brown/orangy haze over the surface. Which might negatively affect the look of the object. In general you can conclude that removing oxidation improves aesthetic appeal and depending on the form and material it can be of benefit for future maintenance and/or longevity. You often see older cars with very matte looking paint. The original look of the car has negatively changed and the paint has faded badly. The most common color to notice this effect is red, but there are many examples of yellow, blue, green and white cars that show the same fading. Although it is commonly said that red fades the most, there are no statistics that support this claim. However, according to research from DuPont, the color red was the most popular color besides white, black and silver/grey. Which would explain why there simply are more red cars that suffer from paintwork fading (= surface oxidation). This happens mainly to cars that have no clear coat. The “unprotected” colored layer of paint reacts differently to light and oxygen which shows the effects of oxidation more then a clear coat. Luckily, the effects are fairly easy to fix. A good clay and a 2 stage polish will in most cases be enough to bring back the shine of the paintwork. Although paintwork without a clear coat will oxidize a lot quicker, and show it’s effects sooner, paintwork with clear coat can also oxidize. Very dirty paintwork that is exposed to many different forms of contaminants can actually oxidize slightly quicker as its surface is effectively bigger. The many microscopic hills and valleys actually increase the effective surface. Yes you can. Certain protective products seal in the surface well enough to prevent it from oxidizing. A layer of wax will oxidize more then the surface underneath, but it will not last forever because the layer of wax will disintegrate over time. A sealant might offer more protection against oxidation because it uses different ingredients that are less prone to disintegration and deterioration. Ceramic coatings might offer more protection seeing as their hard and tough nature. These last 2 protective products will also have more effect on UV than wax. The downside of these products is that they are all temporary. To use a more permanent solution, the surface needs an extensive polishing to remove any form of oxidation and then a total respray with a clear coat. This would be a much more permanent solution, but also a more expensive one. Washing the surface with suitable products will also help. Household cleaning products often contain Citric Acid, which can actually start or push a form of surface oxidation that will eventually result in a very dull look.